The women’s compression socks from Sockwell look and feel good—a win-win for feet. From the yarn to the final product, it’s all Made in the USA. Merino wool, bamboo, and stretch nylon fiber-blend tamps down moisture, helps control temperature and odor, and feels comfortable, soft, and breathable. Medium graduated compression targets four zones of the foot and leg to help minimize swelling and reduce on-your-feet fatigue in modern designs made to blend in with your wardrobe. Dimensions: 16.5" x 4" x 0.25"
Love these socks,will be buying another’s pair. Love these. Very comfortable. Great colors/designs. Wash well and hold their shape. Sockwell wool compression socks are a triple threat. They stand out for how they look, how they feel, and how they're made—which is exactly what Makers Jim Markley, Thomas Lee, and Mercedes Marchand (along with their team in Tennessee) strive for. From the yarn to the final product, the socks are Made in in the USA, which makes them extra special. Sockwell sources wool from American-raised Rambouillet merino sheep and works with U.S. knitting mills. They do this to keep a tight rein on quality and to help reduce their carbon footprint, too. 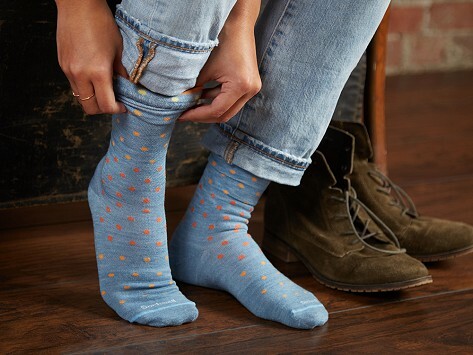 Sockwell puts a lot of thought into the look of each pair of socks and wants them to feel modern while stealthily delivering the benefits of compression, like helping to minimize swelling and reduce fatigue. There’s also a pair to help ease discomfort associated with plantar fasciitis, too. Merino wool and bamboo yarn gives the socks soft cushion and keeps them feeling good by helping regulate moisture, temperature, and odor. When one pair of socks can do so much for you, it’s hard to imagine not wanting a pair.